Remember this? I started this back in June, abandoned it for a long time while I made other stuff, and have finally finished it. 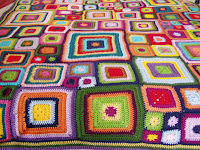 This is the Babette Blanket from last year’s spring Interweave…I love it! All the colors, all the different sized squares. The only thing I do not love are the endless ends to weave in (many of which are still not woven in). But the family is using it and enjoying it. It’s quite large and we love the heaviness of it…quite cozy and warm. I used Red Heart Soft Yarn and Bernat Softee for all the wonderful colors and for economy. It’s perfect. I have tons of other things I’ve either finished or have in the works. Most of these are designs I would like to publish and I’m unsure about whether I can post them before they are published. So we’ll just wait a while. I have been designing crocheted outfits to fit 18″ dolls, such as the American Girl doll. They will be available through Maggie’s Crochet and I’ll post them as soon as they are available. Alas, I no longer have my Knitting Jenny nor its instructions. I wonder if you could locate them via the web somehow. Thanks for visiting!